Steinman travels back in time and across the globe to capture the horrors of WWII as experienced by her father and a Japanese soldier, whom he may have killed. 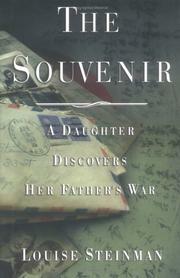 The author starts with childhood memories of her depressed father, Norman, a pragmatic pharmacist, who, after surviving combat in the Philippines, became emotionally withdrawn from his family. After her parents’ deaths, Steinman discovers the roots of Norman’s melancholy in a collection of candid letters that Norman, as a 27-year-old draftee, wrote to her mother detailing his military days—from his infantry training in Texas in 1943 to his departure from a defeated Japan in 1945. The passionate Norman of the past was frustrated by his separation from his family and the meaningless deaths of his army buddies. He was also terrified of fighting fanatical Japanese soldiers who would prefer to perform hara-kiri––ceremonial suicide––before dishonoring Emperor Hirohito with their surrender. Norman’s chronology is interspersed with Steinman’s own eloquent reflections in which she divulges her new sympathy for the repressed man who raised her. The narrative becomes more intriguing when Steinman finds an unsettling souvenir among the letters: a blood-stained Japanese flag, which bears the name of a soldier, Shimizu. Hoping to help others deal with grief, Steinman goes on a quest to return the flag to Shimizu’s surviving family. Traveling to Japan and the Philippines, Steinman locates the graves of Norman’s unlucky war buddies. She also forms friendships with Japanese citizens of Shimizu's hometown, who help her realize the heinous aftermath of America's atom-bomb attack on Hiroshima. During her journey, Steinman both unearths a complex portrait of the real Norman and acquires empathy for the postwar woes of the Japanese. An affecting memoir and a convincing plea for pacifism: Steinman’s hypnotizing prose exposes the senselessness of war by showing how conflicting governments have destroyed families by ripping common people out of their homes and forcing them to kill each other.